Ugh, Christmas is sneaking up on me and I SWORE this would be the year I would be all organized and have all my holiday shopping done by Thanksgiving and have all the presents wrapped, cards mailed and cookies made WAY before now. And then I would have plenty of time to just relax and enjoy some sappy Hallmark Channel Christmas movies while sipping hot cocoa. Next year. Next year is the year it’s all going to happen! So before the holiday smacks me upside the head, I thought I’d show you the rest of my holiday decor. 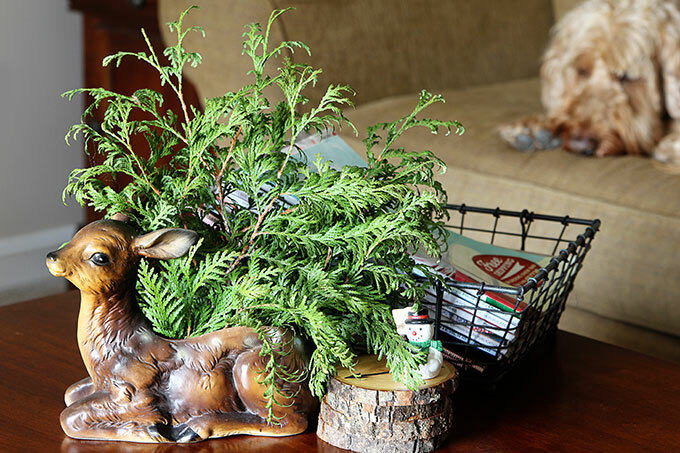 I found this vintage deer planter at a local shop a few weeks ago. I was going to do something all funky with it (I use old planters for remote control holders, pencil holders for my desk, all sorts of things), but decided to actually use it as a planter. I just put some damp florist’s foam in the bottom and stuck some clippings from my yard in it. Oh, look. 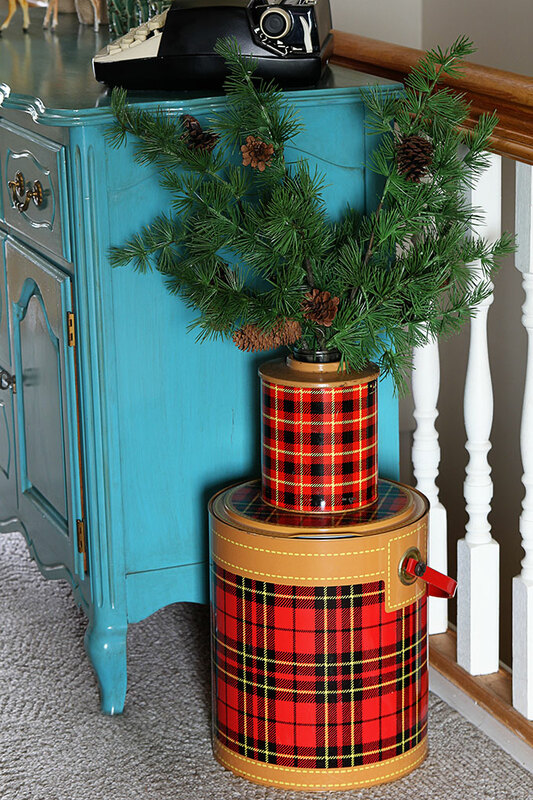 Some plaid thermoses for the holidays. 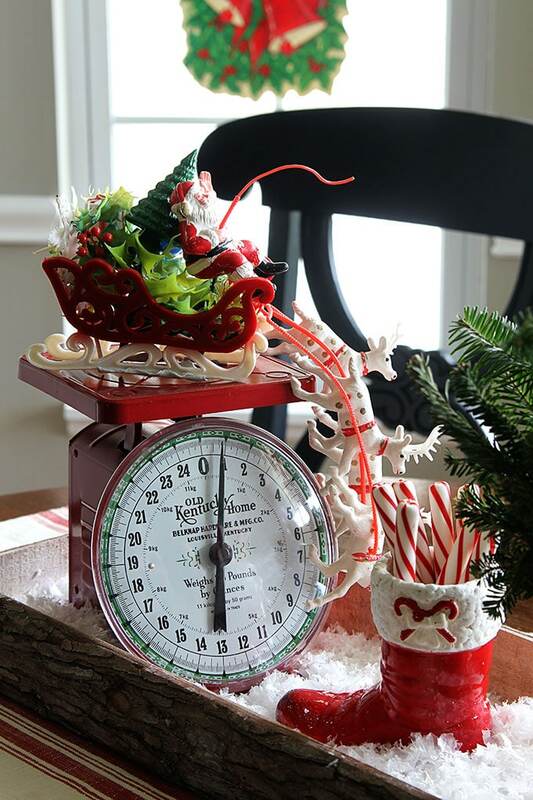 Now that Santa has had his jolt of caffeine, he’ll be flying high the rest of the night. 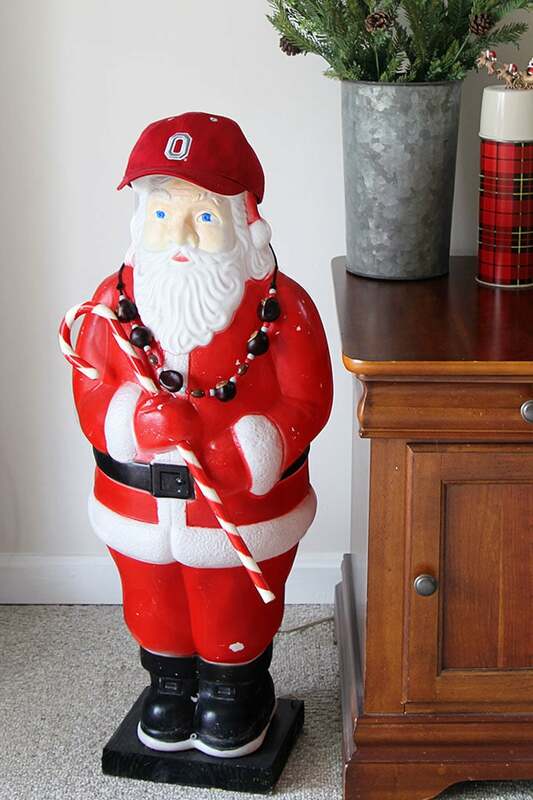 This blow mold Santa used to be outside, but he didn’t go with my porch decor this year, so he’s inside supporting the Buckeyes. I’ll chalk this one up to not being able to draw well. 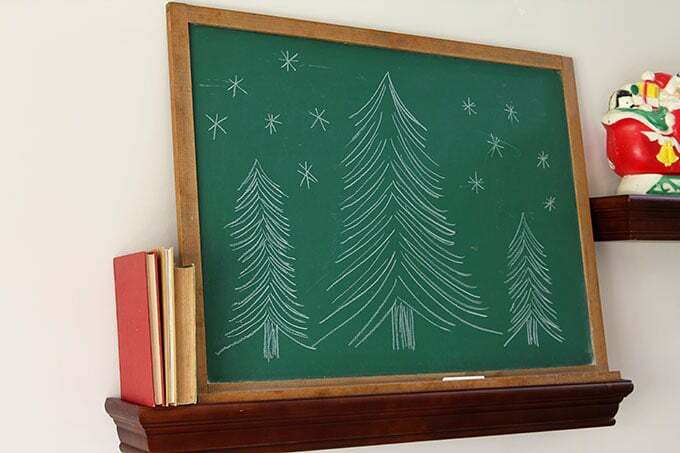 Stick trees and asterisk stars are so much easier to draw than a handwritten inspirational quote in a fancy font. Been there, done that, don’t have the time this year. Here’s an inspirational quote for you “Do what you can to make Christmas a little easier to handle this year! Don’t sweat the small stuff that will just get erased in a few weeks”. 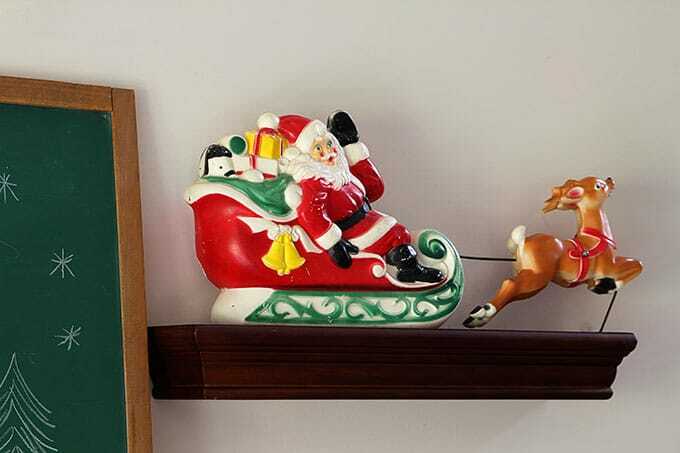 This is one of my favorite blow mold Santas. He’s jolly, he’s friendly (he’s waving after all) and he’s colorful. What’s not to love. And this is my Skotch Kooler Christmas tree. I was hoping to find one more to make the tree a little taller, but I’ll wait until I find one out in the wild rather than buying one on ebay. It’s the thrill of the hunt. I’ve decided that plastic deer are the new black. 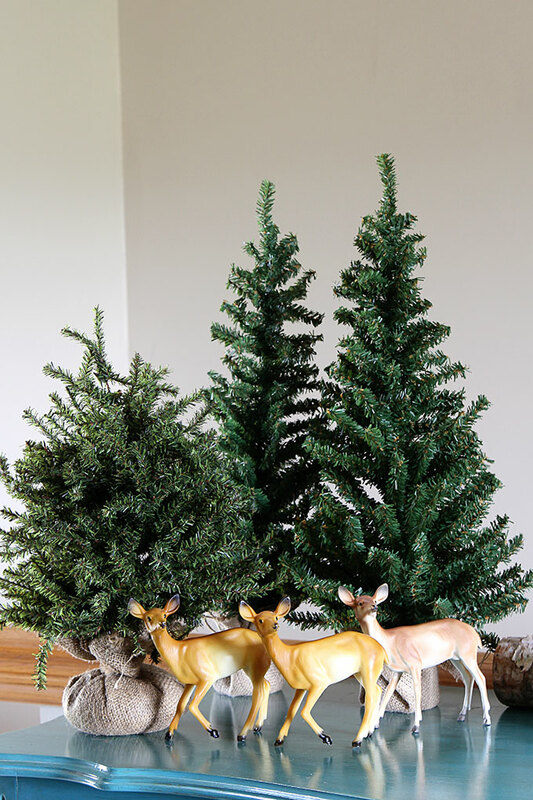 You can plop them down anywhere and all of a sudden you have a Christmas vignette. Instant holiday happiness by way of some old five and dime deer. And you’ll notice that my main deer did not change his attire since last Christmas. Still the hunter who prefers to use a camera, not a gun. If you’re going to commit to a look, then by golly, commit! 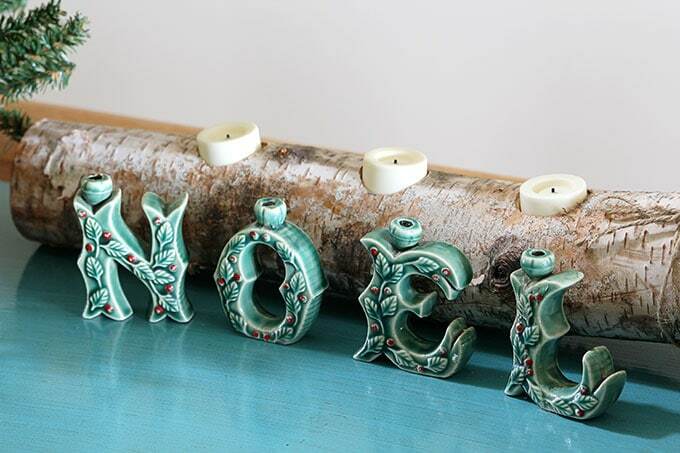 I made this simple yule log out of a piece of birch that I drilled holes in for the candles (battery operated ones, so I wouldn’t light the house on fire). 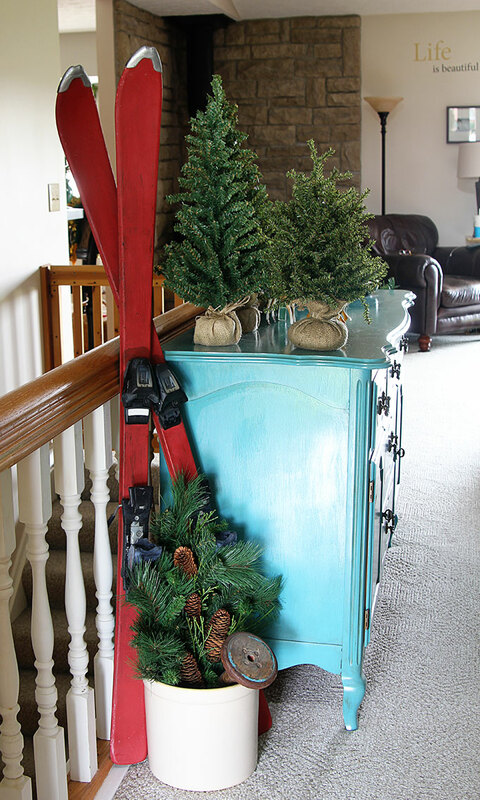 My chalk painted skis are inside the house this year instead of on the porch. 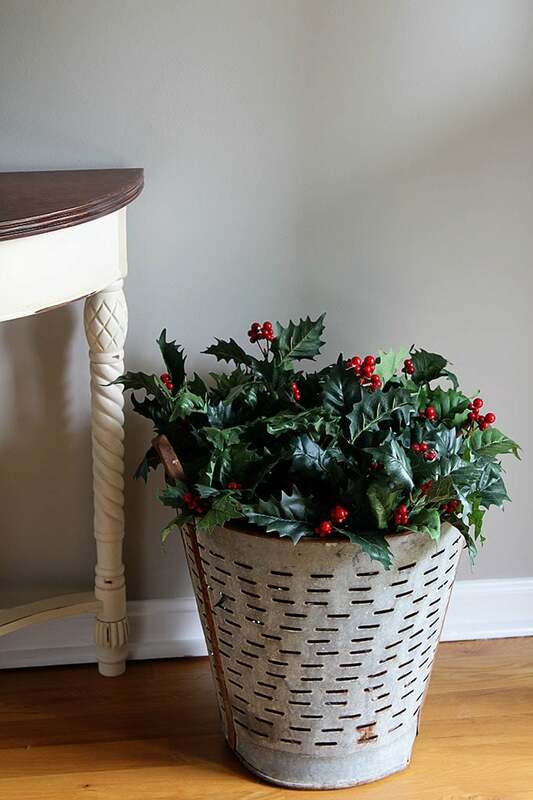 I kept it very very very SIMPLE this year in the entryway. Very simple. I moved the metal rolling table that you had seen in the Vintage Eclectic Style – Kicking Traditional To The Curb post back up to my office and brought a little bit of the traditional back from the curb. Just a little. I found this cardboard boot with mica snow at an estate sale last year. It’s pretty big, maybe 14″ or so tall and I just love its 60’s vibe. 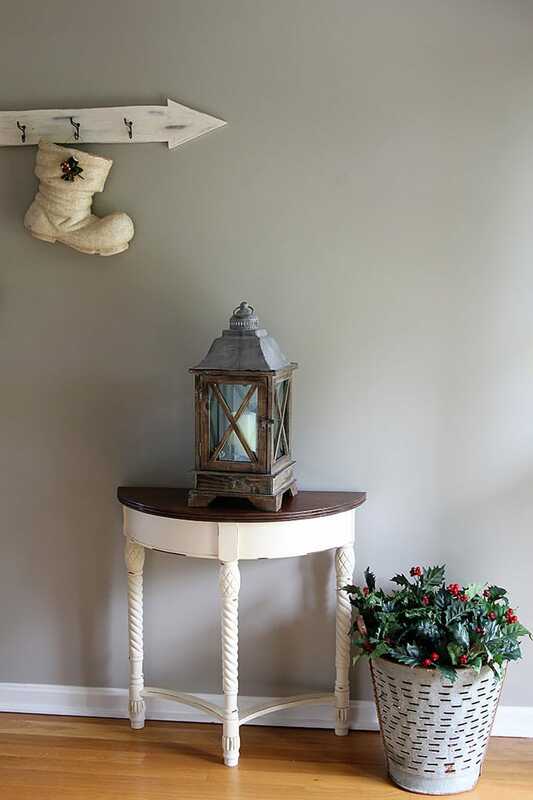 The holly on the boot matches the holly in the olive bucket and, not that you can see it from here, the holly in the wooden lantern. Just call me matchy matchy. I have no idea where I bought this snowman on skis. He’s not really vintage, he just looks a little vintage-esque. Well, I think that’s all for the tour today. I have something extra special to show you next time. Let’s just say that sometimes a trend goes out of style for a reason and I’m going to show you why. 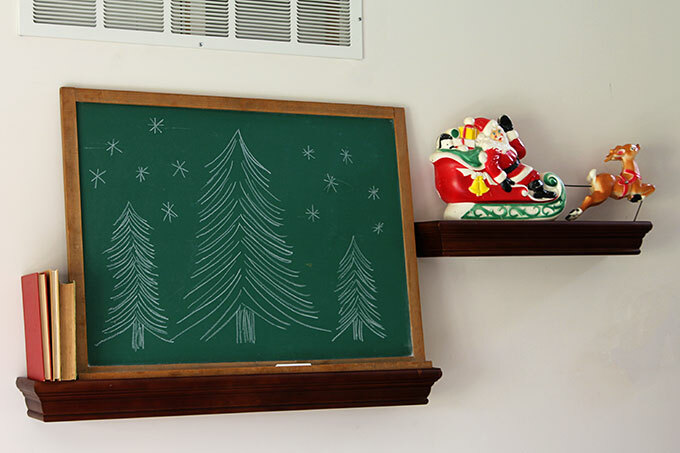 How’s your holiday to-do list going? Do you have your feet propped up watching Christmas movies with B-list stars? Or are you still running all over town like I am? I smiled all the way through this fun post, Pam! I LOVE your decorating! 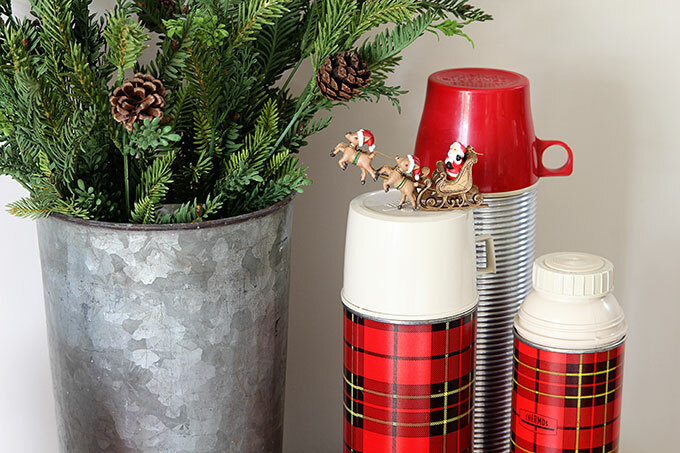 The little sleigh on the thermos is pure whimsy! Still smiling! So festive and homey! Thanks for sharing. Thank you for sharing another year of such a fun website! MERRY CHRISTMAS! Merry Christmas, to you and your family, Aimee! I love everything!!! 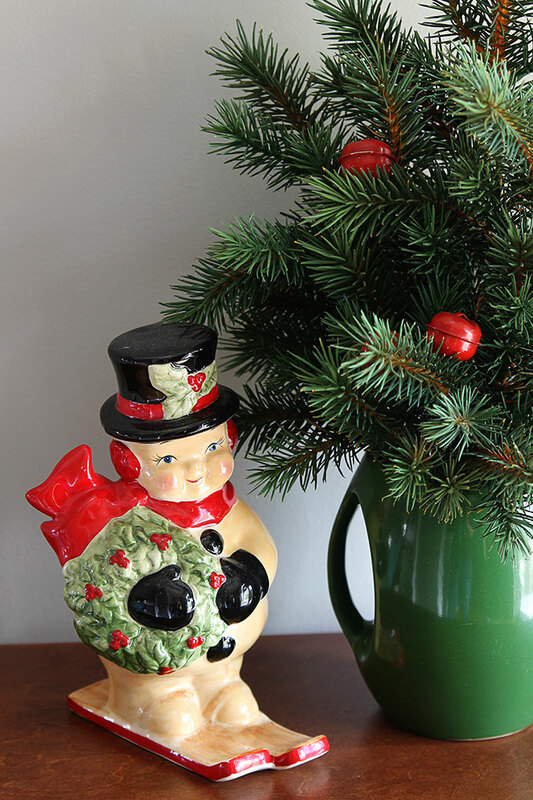 Vintage Christmas is one of my middle names and I love all of it!! Thanks for sharing. Pam you’ve got the coolest home! 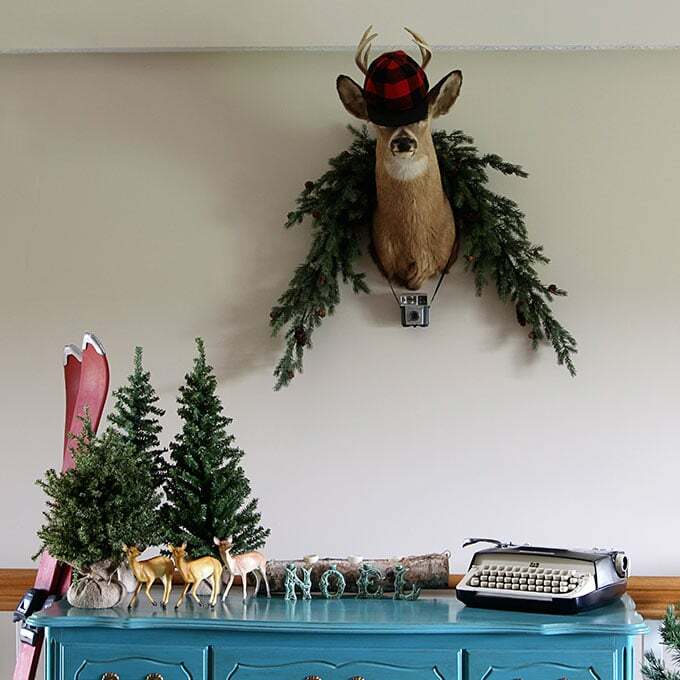 I especially love that decorated deer head and all that red and black plaid! 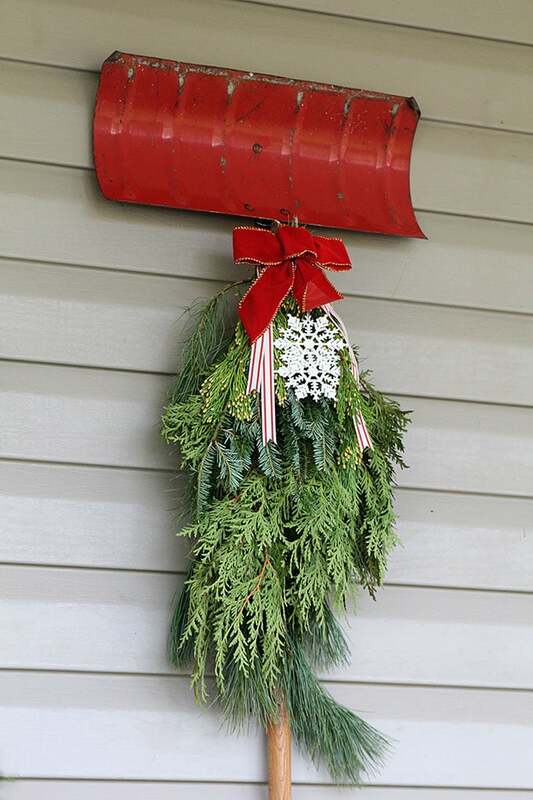 Thanks for sharing all of your delightful holiday decorations! They are all darling. Pam I love all of your vintage touches! My favorite is the blow mold Santa and the shovel. 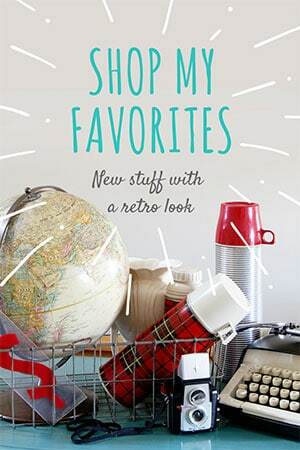 LOVE all of your vintage-y goodness!!! I always enjoy your wicked sense of humor, Pam, and you’re in top form tonight! I’ll have to remember that deer are the new black. 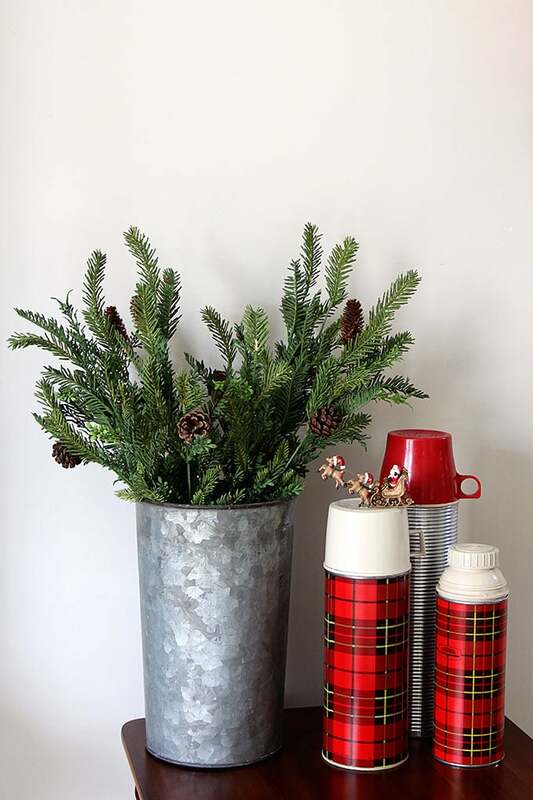 hehe I love all your vintage finds and how you’ve used them throughout your home. Now, does the boot point the other way when it’s time for guests to leave? I love your holiday decorating style so much!! 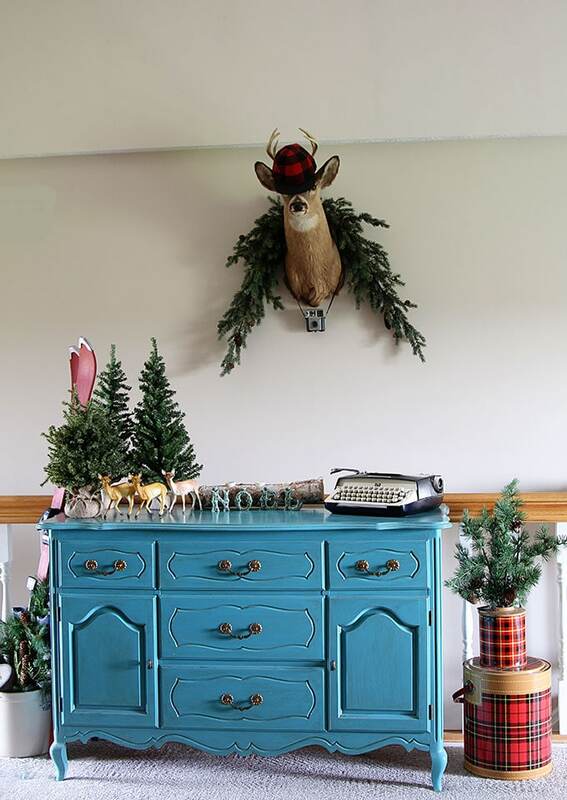 This year, my house is vintage/kitsch with a farmhouse/rustic tree. Eclectic is the new black!! Your home is filled with uncommon pretty things. I absolutely love the deer head with the hat on his head. 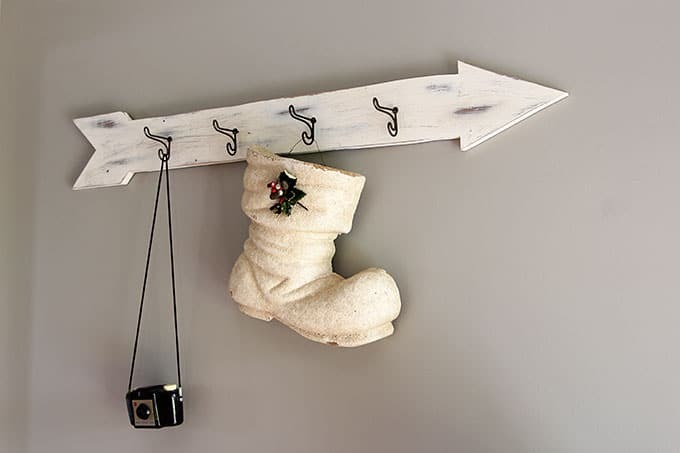 And that boot that is hanging on the hooks is just adorable. Your home reminds me of a simpler time gone by when life was much more peaceful and not as rushed. It is filled with all of those special deails that make a home so special. I don’t typically post comments, but, really felt compelled after seeing your fantastic ideas for all those thrifty finds. 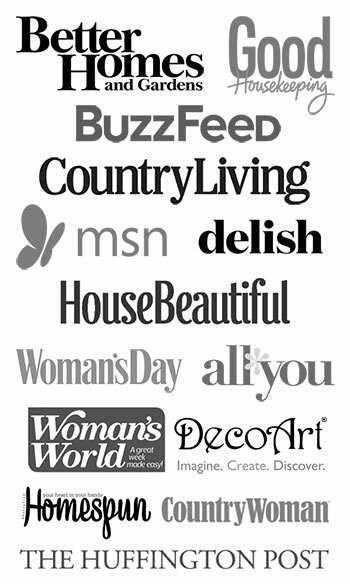 Each one is just beautiful and I love your creativity…..plus, the lighthearted fun of your thoughts on everything. Especially your declaration that “plastic deer are the new black”. I have one just like your small herd, that somehow survived my childhood. Thanks for sharing your entertaining and insightful blog throughout the year. Hope you have a Merry Christmas! Thank you so much for commenting! You MADE MY DAY! I love writing this blog and love when people appreciate all the hard work! Saw your tour on Blogtalk and love every little detail! I would love you to link up at our Vintage Charm party tomorrow! Merry Christmas! I’d love to 🙂 I’ll stop by. Thank you for sharing your whimsical vintage tour @Vintage Charm ~it really is one of the best I’ve seen! Merry Christmas! I am pinning to our Features & Favorites Board! Perfectly vintage and wonderful! A tour after my own heart! xo Merry Christmas! Love this, I came to look at this year’s post but ended up on this one also. The snowman on ski’s I think came from TARGET. I have one too. Bought him because he looked vintage. A few more years and they will be!